Surprisingly enough, with all of the restaurants that there are in Fort Lauderdale, there really aren’t many vegan options here. Sure there’s Sublime, the well known, all vegan, over priced, bland and uninspired restaurant, but I hate giving them my money, even if the profits do go to animals. That being said, let me tell you about a mexican place that’s really close to our new place, and at least has a little vegan section on their menu. This review is actually long overdue. We dined at Tequila Sunrise last year when we got one of those groupon/living social vouchers. Back then they had the menu that’s currently up on their website. 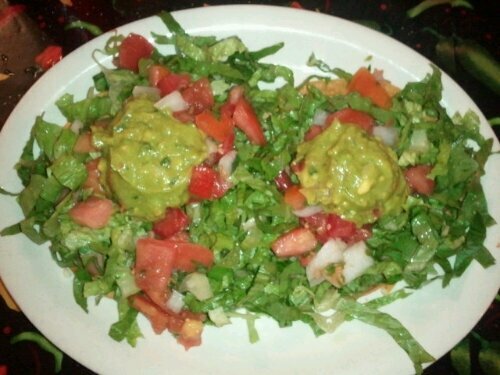 I ordered the vegan black bean tostadas, which I thought were great. On this visit, the vegetarian/vegan menu was just a section of the regular menu, and a lot more limited. 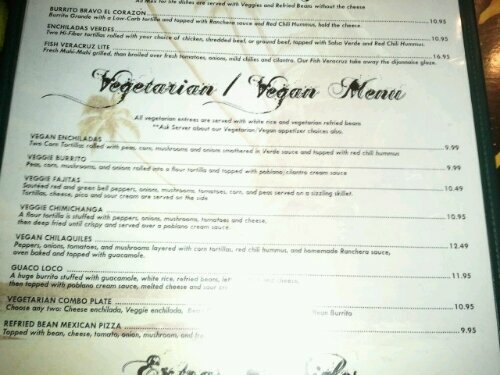 I was happy though, because they still had vegan enchiladas listed, even if the tostadas weren’t. I specified that I didn’t want mushrooms at least 3 times. Mostly because it seemed like our waitress wasn’t paying attention. She let me know I could sub vegetables instead of white rice, so I said sure. When my plate came and I spotted a mushroom in the vegetables, I remembered that I had not asked an additional time for no mushrooms, so I was still hopeful, but upon peering into my enchiladas I realized they were all over. A second waitress came out and said that there was no way to make the dish without mushrooms, because the veggies were already mixed. Then she came back and said they could do it with just onions & peppers inside. So I just ordered two tacos a la carte. 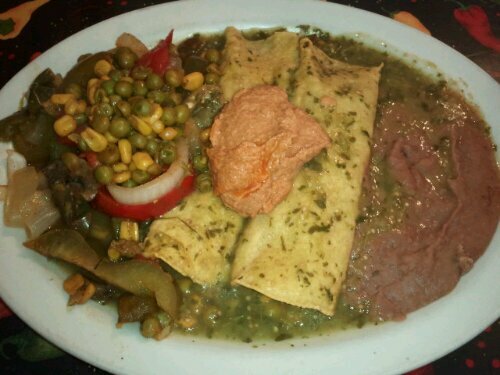 Both the black beans and the refried beans are vegetarian, so I ordered one of each. They came in very thick, delicious hot shells, and the black beans were really tasty. These were $3.50 each. We eat mexican food A LOT. Half the time it’s from Taco Bell. (fresco bean burritos or the occassional 7-layer, no cheese, no sour cream!) 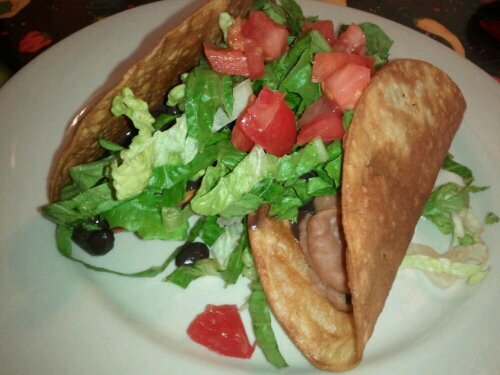 And I admit, I don’t ever ask if the beans are vegetarian when I’m at a restaurant. So it’s nice to know that they are here. If you aren’t allergic and/or grossed out by mushrooms (like I am! ), they have a good amount of well thought out vegan options for you. I mean, that enchilada dish really did look delicious. I was pretty disappointed that I had to give it back! So if you’re so inclined, it’s worth checking out. Tequila Sunrise is located at 4711 c N Dixie Hwy Oakland Park, FL 33334. (954) 938-4473. Open Mon-Wed 11:30am – 10pm, Thurs – Sat 11:30 am – 11pm, and Sunday 12pm – 10pm.